From Mesoamerican foodways to cooking for an occupation, these 11 books run the gamut. With pumpkin pie spice in the air, it’s time to stock up on good books for the cold months ahead. This season’s crop of new vegetarian titles covers a lot of ground and provides plenty of reading material. 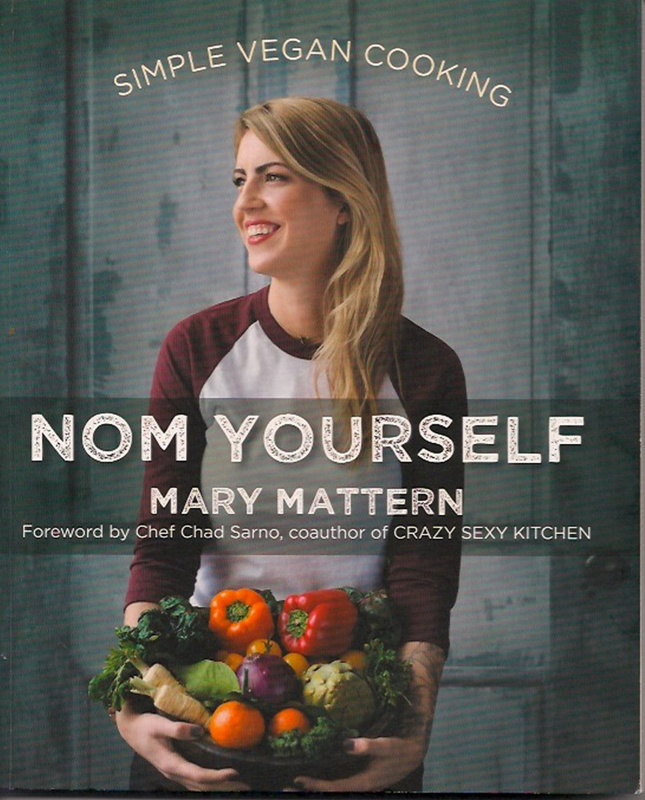 Included among this group of 11 new books are well-known names (Mary Mattern’s “Nom Yourself”), unique concepts (“Decolonize Your Diet”) and radical ideas (“The Anarchist Cookbook”), along with plenty of solid books covering the basics of plant-centric cooking. Casting back to pre-colonization foodways, the writers of this unique cookbook discuss Mesoamerican cuisine before Europeans brought “wheat, beef, cheese, cooking oils, and sugar.” Fittingly, the first recipe is for tamale (or masa) dough and the second is for making nixtamal, more commonly known as masa harina flour. Detailed recipes follow for using the dough to make tortillas and many other dishes, such as Tlacoyos con Quelites, Butternut Squash & Roasted Green Chile Tomalitos and Xocolatamal. Native beans, seeds, grains and wild plants dominate the recipes, all of which bring together the modern and the ancestral. A chapter on drinks includes the traditional drinks of Chicha Morada (a purple corn drink) and Tepache (a spicy fermented drink). “Eat Like You Give A Damn: Recipes for the New Ethical Vegan,” by Michelle Schwegmann and Josh Hooten, $24.95, Book Publishing Co. Written by the owners of the Herbivore clothing store in the other Portland, this cookbook is based firmly in the animal rights movement yet acknowledges “it’s okay for vegans to love meat and cheese.” Because of this, many of the recipes riff on traditional meat-based dishes, such as Sausage Biscuit Breakfast Sandwiches, Better-than-Bacon Coconut Flakes, Portobello-Chickpea Wellington, barbecue sauce and a whole series of dairy-free cheeses. It also includes many unusual recipes such as Brussels Sprouts Slaw with Walnuts, Apricots, and Garlic Aioli; Savory Chickpea Pancakes; Charred Green Beans with Peanut-Hoisin Sauce; and Sweet Potato Ravioli with Popeye Pesto Sauce. Among the dessert recipes are Sweetpea Snickerdoodles (from the Sweetpea Baking Company) and Hazelnut, Hemp, and Cherry Oat Bars. This self-help-style cookbook offers a road map to transitioning to a no-oil, plant-based lifestyle. Rather than oil, Chamberlin uses vegetable broth, table wine and water to sauté. Appealing to new vegans, the beautifully illustrated dishes in the recipe section feature lots of veggie staples, such as almond milk, green smoothies, black bean chili, sesame noodles, enchiladas and sushi rolls. Other recipes chart a different course, with dishes such as Baked Almond Butter French Toast, Asian Lettuce Boats and Two-Bean Quinoa Salad with Basil Citrus Dressing. Dessert brings dishes ranging from Baklava Baked Apples to Strawberry Nice Cream. 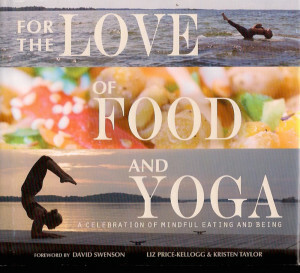 This colorful, hardbound coffee table book combines mindful meditations, photos of yoga poses and vegetarian recipes. 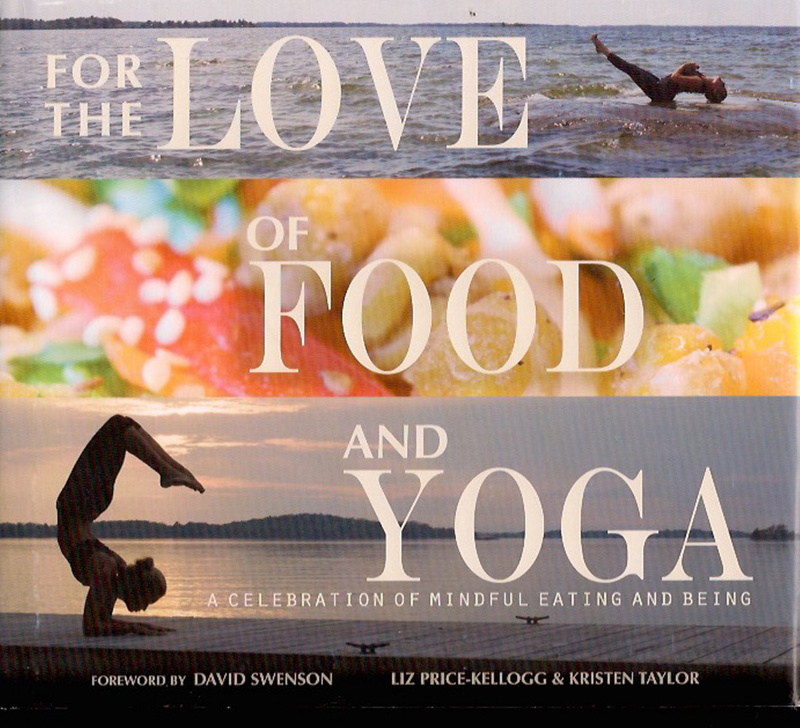 Written by a yoga instructor and a yoga practitioner, the book seeks to bring the yoga lessons of mindfulness, presence, intention, gratitude and joy into the kitchen. Many veg standards fill the recipe section (such as hummus, tempeh bahn mi sandwiches, tacos and lasagna). More unusual dishes include Scorpion Sweet Potato soup, Chakra Vegetable Slaw, Thoughtful Not-Too-Tuna Melt, Buddha Bake and Wealthy Wonton Purses. Desserts – Price-Taylor and Kellogg call them Surrenderings – include chocolate mousse, Namaste Napoleons and Perfectly Imperfect Pumpkin Pie Ice Cream. The book finishes with a collection of smoothies, such as Strawberry Savasana and Bloody Merry. Combining stories of healing, instructions for juice cleansing and many recipes, this tidy book serves up a wide range of uses for juicers and high-powered blenders. Montgomery begins by recommending equipment, including information about sophisticated home water filtration systems. Most of the recipes are devoted to smoothies (Dandelion Dreams; Choc-Mint; Strawberry Pick Me Up) and juices (Tomato-Watermelon; Fat Melt-Down; Wheatgrass Cocktail). However, the recipe section also covers basic nut milks and flavored nut milks, teas (including kombucha and kefir) and soups, such as Sweet Corn Chowder, African Sweet Potato-Peanut Soup and Blushing Borscht. A restaurant consultant and celebrity chef who runs the Nom Yourself vegan website, Mattern and her Instagram account are part of the reason plant-based cuisine rose from boring to beautiful. Her debut cookbook includes many intriguing takes on American standards (such as California Tofu Benedict and Cauliflower Ricotta Stuffed Shells) plus many unique dishes, ranging from Sweet Potato Waffle Sandwiches and Sesame Tofu Tacos to Deep-Fried Guacamole and Tempeh Bacon Spinach Quiche. Dessert means Grandma Mattern’s Date Nut Bread, Whiskey Lady Cupcakes and Blackberry-Coconut Wonton Cups. The book also includes a short chapter on how to make six pantry staples and a guide to artful plating. A straightforward guide to cooking plant-based meals, this beautiful, hardbound book is filled with staple vegan recipes that every new vegetarian should know, such as hummus, fried green tomatoes and sesame noodles. It also includes many sophisticated recipes that will appeal to longer-term vegetarians, such as Korean Barbecue Sliders, Roasted Corn with Poblano-Cilantro Butter and Parsnip Cupcakes with Sour Cream Icing. Sprinkled between the recipes are a few helpful illustrated guides that include a list of dairy substitutes and their uses and a vegan baking substitutions chart. An illustrated Plant-Based Cooking Techniques guide at the beginning covers everything about vegetable preparation from steaming to blanching with added instructions for cooking rice, pasta and beans and making seitan. An accessible five-step guide to enjoying and sticking with a plant-based diet, this book is written for those aiming to adopt the type of plant-based diet rooted in the past two decades of nutrition research. Fittingly, it has a foreword written by Dr. Neal Barnard, and a preface written by Dr. T. Colin Campbell. This guide to dietary transformation covers everything from selecting foods and transition styles to navigating restaurant menus and handling “food pushers.” Recipes include a number of “templates” for constructing common vegetarian dishes, such as veggie burgers, Buddha bowls and vegetable soup. In addition, a selection of recipes at the back includes Crispy Coconut Waffles, Lickety-Split Lasagna, Portobello Pot Roast and Mandarin Chocolate Ice Cream. 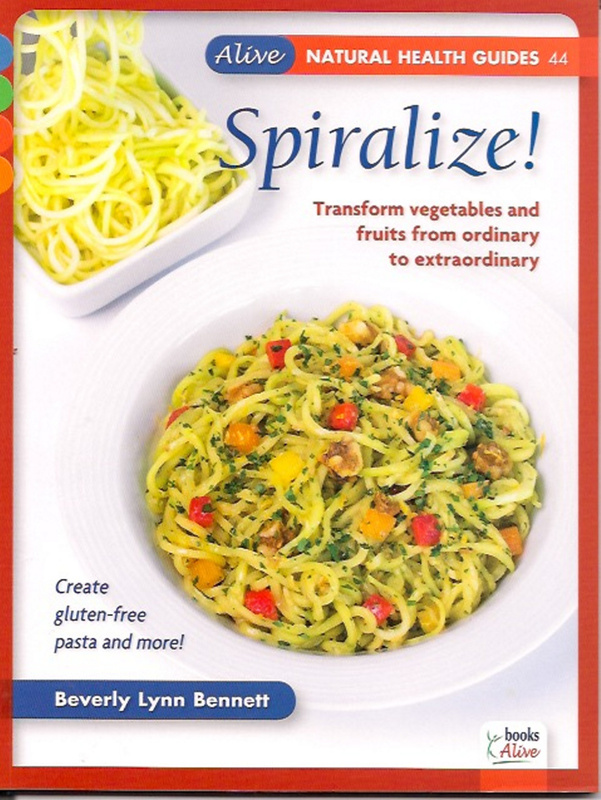 This pretty little book that easily slips into a purse or shopping bag provides an accessible introduction to the current health food craze for spiralizing. 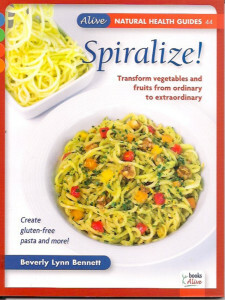 While already popular with people interested in raw, gluten-free or paleo diets, spiralizers, Bennett points out, are “especially convenient for people with minimal knife skills.” The book includes information on the variety of spiralizers on the market, as well as tips on how best to use them. While the recipes feature a few salads (Cucumber Noodle Greek Salad; Mixed Greens with Jicama and Apple), most are for unexpected cooked dishes, such as Tater-Wrapped Vegan Sausages, Carrot Cake Muffins, Quinoa and Root Vegetable Pilaf and Farmers’ Market Quesadillas. In this attractive, hardbound book the author of “Happy Healthy Gut” follows up with more recipes to please the microbiome and keep IBS and other digestive issues at bay. The book begins with a guide to pantry stocking, a list of kitchen tool essentials and an introduction to cleansing. With chapters devoted to juices, smoothies and salads, “Vegetarian Comfort Foods” leans in the raw direction. Yet cooked recipes also abound, such as Breakfast Quinoa with Honey and Bananas, Yam Burgers, Eastern Lettuce Wraps, Pistachio Stuffed Figs and Easy As (Pizza) Pie. Desserts range from Pink Salt Two-Bite Brownies and Chunky Monkey Cookies to Apricot Bars and Purple Berry Crumble.